What the hell happened last Friday in the social business world? 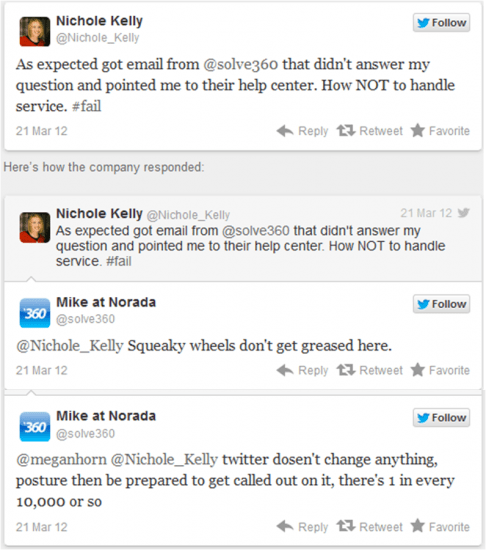 Did the planets align to erase the business brains of people at the customer facing keyboards of 3 disparate companies? Alien hackers took over twitter and customer relationship accounts? Or did 3 companies just get lazy while working in the connected world? While I do think weirdness happens outside of our little world, my money is on the latter (laziness). In my opinion, this is a company culture issue. From bottom to top, this company does not understand service (which doesn’t bode well for a Customer Relationship Management software company). They choose to see service as an unwelcomed cost of doing business, instead of looking at it as an opportunity to help a customer, build a relationship, move a challenger to a champion, or even just retain a current customer. While this may be random incident or everyone was having a case of the Mondays, but Solve360 may want to take a step back, get clear on their Values and decide if retention and loyalty are critical to a cloud or SAAS company (guess what – it is). 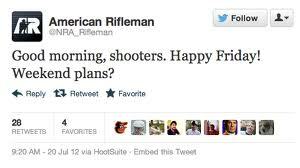 This Twitter post is from the NRA (National Rifle Association) the morning of the Aurora murders. On the surface, it appears to be horribly disrespectful and frankly disgusting. The post was deleted from their Twitter stream not long after posting, but what happens on the internet stays on the internet. However, I believe there is more to this story. My assumption is this was a scheduled tweet, scheduled well before we learned of the events in Aurora. Scheduling tweets is a perfectly acceptable practice of social business. It allows you to create conversations off hours, reach different sets of audiences, and smooth out the workload for your conversation agents. Scheduling is a shortcut; shortcuts are needed. However, every shortcut comes at a risk (otherwise it would not be a shortcut). Like any other area of business, you need to understand your risks, determine what is acceptable, transferrable, or worth creating mitigation steps. In the NRA’s (controversial) line of business, it is sad to say that incidents like last Friday’s massacre can happen at any time. While I would not stop scheduling, I would ensure they have a crisis management plan in place, and understand their roles in executing. On another note, I think they were smart in deleting the tweet, but they missed an equally important step, admitting to their mistake. As of this date, I have not seen an apology tweet or link (it doesn’t mean that it doesn’t exist). They may have even deleted the entire account name, as it is no longer exists on Twitter. A simple, accountable explanation with an apology and thoughts toward the impacted families/friends would have gone a long way. By now many folks have heard and/or seen the @Celebboutique tweet from last Friday, only a mere few hours after the horrific tragedy in an Aurora, CO movie theater. I think the picture above speaks to the shear ignorance of person at the helm of their twitter account. I am not here to beat a dead horse; I am here to help with the lessons learned. Post the immediate public uproar, @Celebboutique tried to apologize. Based on the follow up tweets from @Celebboutique, they did not heed to my rules of effective outsourcing. Their last mistake in the myriad of mistakes was their placing blame on their foreign outsourcer. When I interact with a company, I see it as a single entity. For example, if I shop at Costco, I do not think about how it affects their supply chain department, marketing, or human resources; it is just Costco. As a consumer, I have enough brands occupying my attention; I don’t separate companies into divisions. Regardless, if @Celebboutique hit the enter key or not, it was their company’s mistake; own it.